Is it sudden death time? Has the Match Game TV show been cancelled or renewed for a fourth season on ABC? The television vulture is watching all the latest cancellation and renewal news, so this page is the place to track the status of Match Game, season four. Bookmark it, or subscribe for the latest updates. Remember, the television vulture is watching your shows. Are you? A game show airing on the ABC television network, Match Game is hosted by Alec Baldwin. In the third season, celebrity panelists include: Joel McHale, Niecy Nash, Mark Duplass, Caroline Rhea, Jason Ritter, and Constance Zimmer. On Match Game, contestants try to match the answers to “fill in the blank” questions with as many celebrities as they can. At stake is a grand prize of $25,000. The third season of Match Game averaged a 0.66 rating in the 18-49 demographic and 3.20 million viewers. Compared to season two, that’s down by 23% in the demo and down by 4% in viewership. Find out how Match Game stacks up against other ABC TV shows. Match Game has apparently been renewed for a fourth season which will debut January 9, 2019. Stay tuned for further updates. 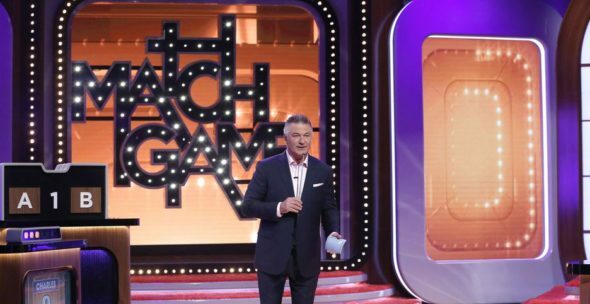 Will ABC cancel or renew Match Game for season four? The show continued its downward slide in the ratings last year so, even though game shows are far cheaper to produce than scripted fare, the network can only afford to let them go so low. Thus far the Match Game’s ratings have remained pretty steady which is no easy feat these days. For now, I suspect that Match Game will be renewed. I’m going to keep a hungry eye on the Nielsens and update this page with breaking developments. Subscribe for free alerts on Match Game cancellation or renewal news. TV show ratings are still important. Follow Match Game‘s weekly ups and downs. Find more Match Game TV series news or other ABC TV show news. What do you think? Are you glad that the Match Game TV show has been renewed for a fourth season? How would you feel if ABC had cancelled this TV series, instead? The $100,000 Pyramid: Is the ABC TV Series Cancelled or Renewed for Season Four? The Alec Baldwin Show: Is the ABC TV Series Cancelled or Renewed for Season Two? For the People: Is the ABC TV Show Cancelled or Renewed for Season Two? Time After Time: Has the ABC TV Show Been Cancelled or Renewed for Season Two? Match Game is way funny for adults with a brain. Please keep it! If you can keep the stupid “reality” shows you can keep this one. I dont care for all the political crap you get. I want to watch to be entertained, also it gets dirtier with every show. I quite watching a couple of weeks ago. I don’t care for the political comments. I want to be entertained and I don’t care about the celebrites’ political views. This show makes me laugh. I say keep it going. It is better than half of the shows on these days!